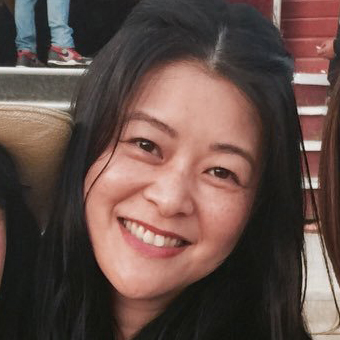 They first met as university students at Royal Roads University in Victoria and remained friends after graduating. Dylan moved to the Cayman Islands, then to Toronto, before settling back in Vancouver. When he eventually found his way back the pair kept bumping into each other in the city. These street meetings progressed to dates and less than a year later, they were engaged. 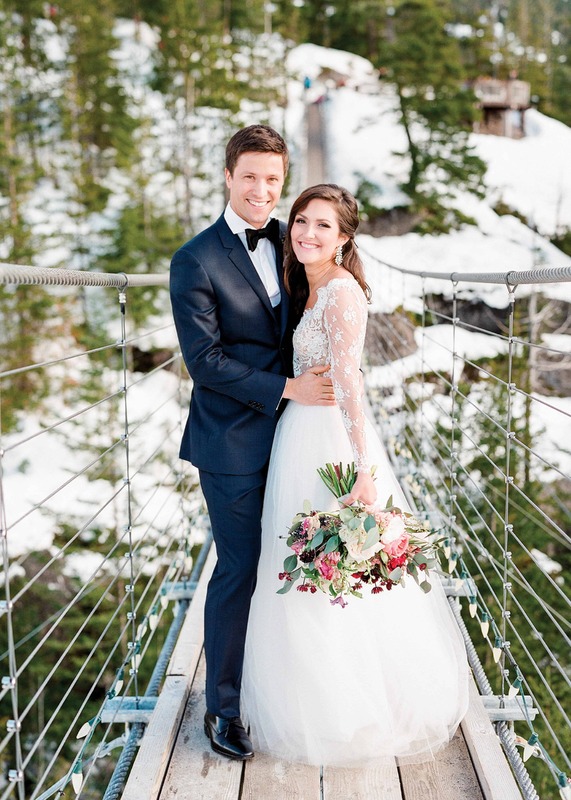 On February 6, 2016, the long-time friends were married atop the Sea to Sky Gondola in Squamish. 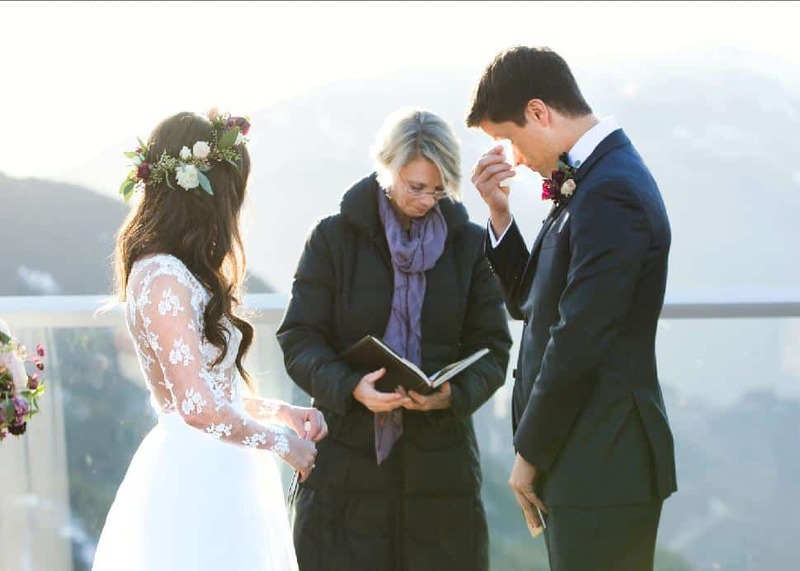 “We knew we wanted to get married in the winter and, well... we really didn’t want to wait any longer,” laughs Jessica. 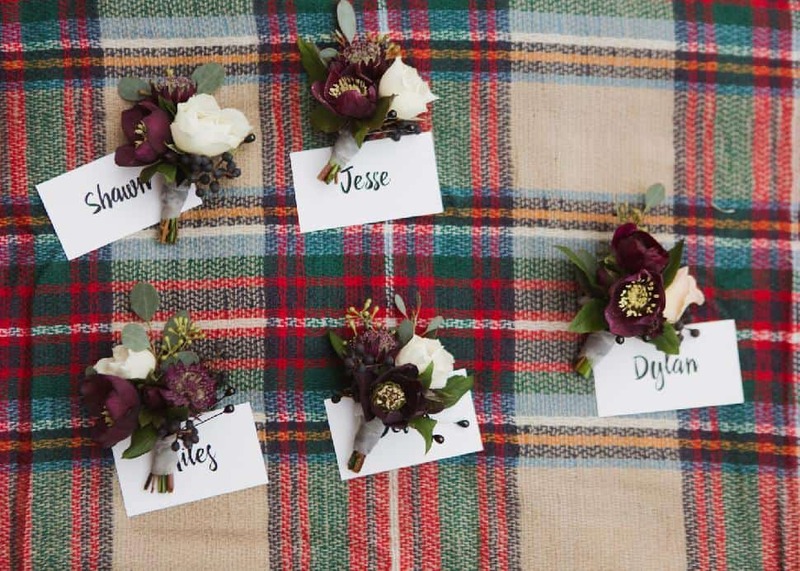 “The venue was perfect for us because we love the outdoors and it showcases the best of B.C., especially for our out-of-town guests,” the couple shares. 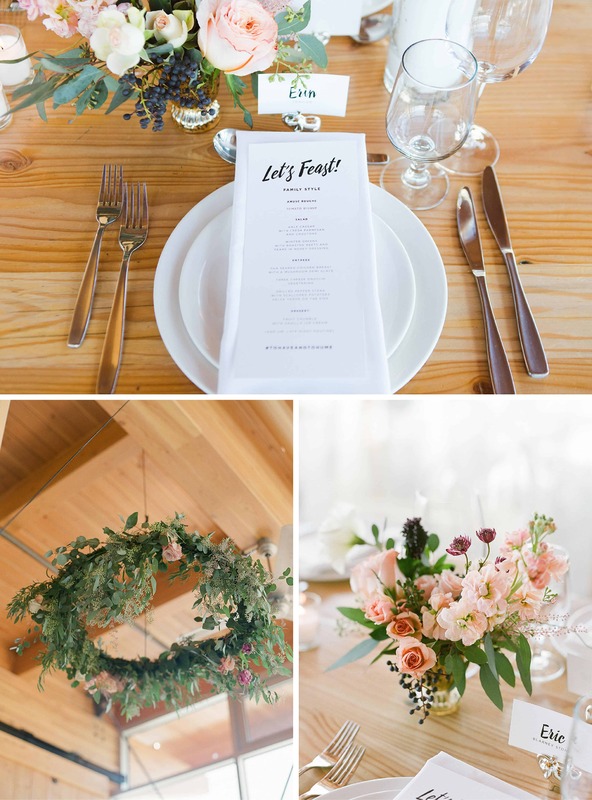 Having a grand, effortless event was their biggest priority and, for that, the couple credits their day-of coordinator, Margot Watt of Petite Pearl Events. 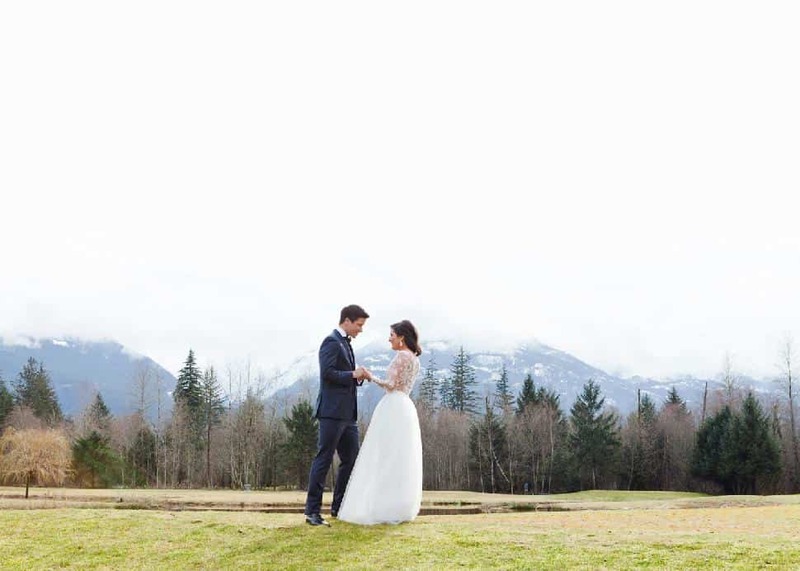 Jessica’s custom lace and tulle wedding dress by Joanna Delaney was cleverly designed in two pieces: a bodysuit with interchangeable long skirt for the ceremony and shorter skirt for dancing. Dylan wore a bespoke three-piece navy blue suit from Indochino. The bridesmaids wore gowns designed by Joanna Delaney, each in a subtly varied shade of dove grey. To stay warm, the ladies wore vintage fur coats and capes, and Jessica wore her “something borrowed,” a white mink stole. The groomsmen wore navy blue suits to match the groom. 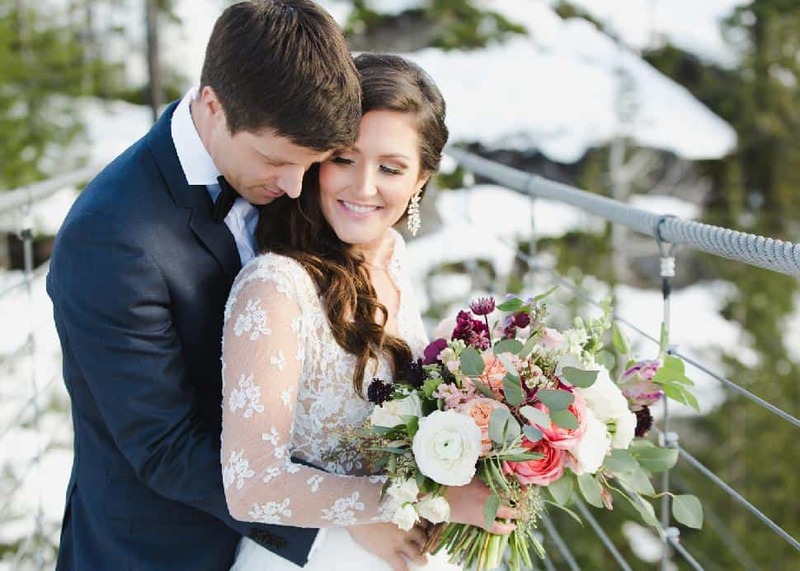 The spectacular panorama at the top of the Sea to Sky Gondola served as the snow-capped backdrop to their winter wonderland wedding. 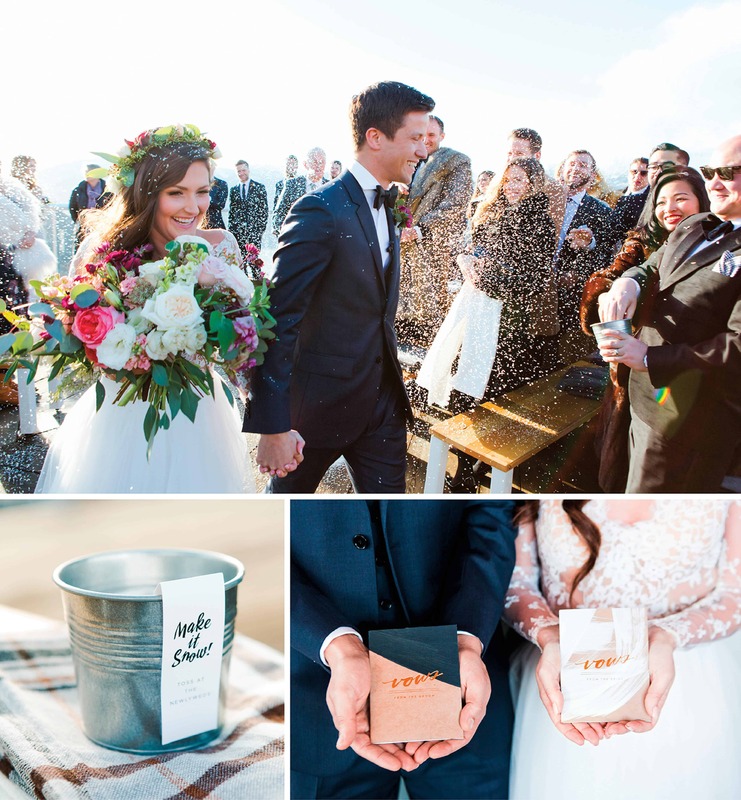 Personal touches were woven throughout the ceremony: inside jokes printed on name cards; miniature buckets of biodegradable “snow” for tossing into the air; and a bottle of organic Malbec (the couple’s favourite) at the head table to share during dinner. 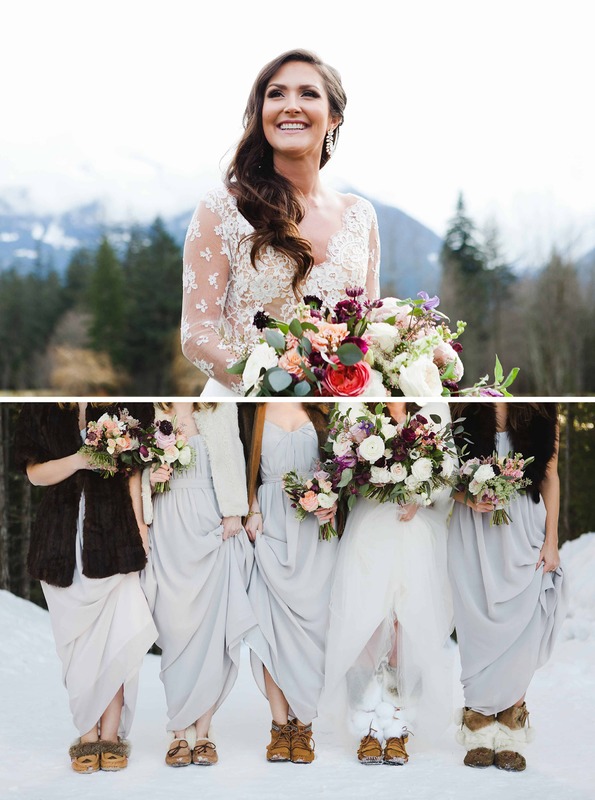 Having a gorgeous, show-stopping bridal bouquet was a priority for Jessica and Celsia Floral delivered with richly textured ranunculus, amaryllis, peonies and black privet berries. The stationery was produced by Design Spectacle and featured linen paper and an edgy but elegant font created by one of the bridesmaids. 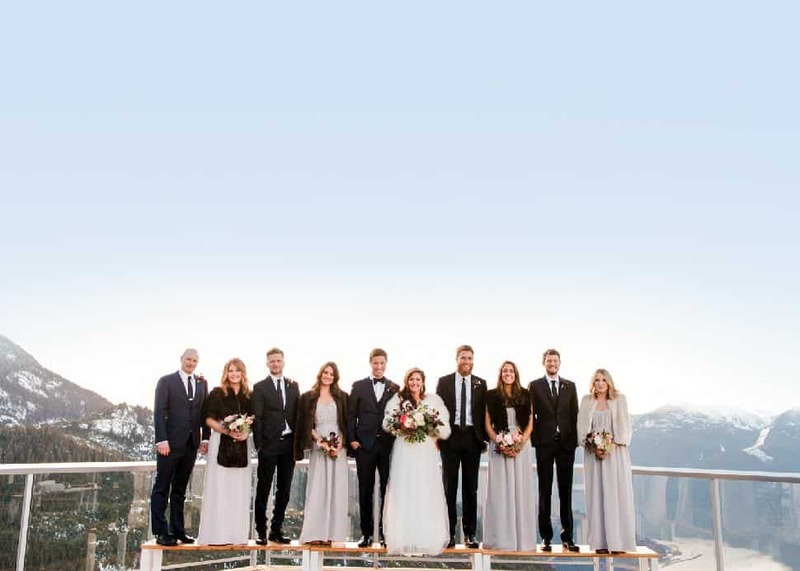 Clear ghost chairs from Pedersen's Event Rentals kept the focus on the large wooden plank tables—the ideal setting for the family-style dinner catered by Sea to Sky Gondola. Dressed in Jessica’s favourite colour, black, the two-tier chocolate salted caramel cake from A. Elizabeth Cakes was a special surprise from one of the guests. 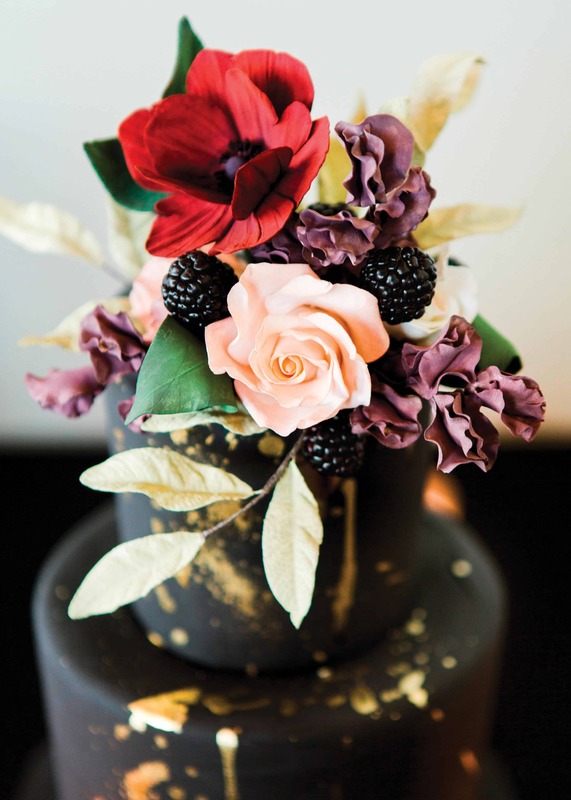 The sugar-flowers and blackberries on top mirror those in the bride's bouquet. Brianna Errelat Hair + Makeup kept the aesthetics casual yet polished with long tresses, natural makeup and soft pink lips. Jessica accessorized with jewellery from Elsa Corsi and beneath her dress she wore moccasins from Hill’s Gallery and calf warmers made by her sister-in-law. Videographer Tomasz Wagner produced a stunning film to commemorate the day, captured on Super 8 film. It includes moments from the ceremony with commissioner Carol Guinn and the love- and dance-filled after party with music by DJ Pri from GirlOnWax. 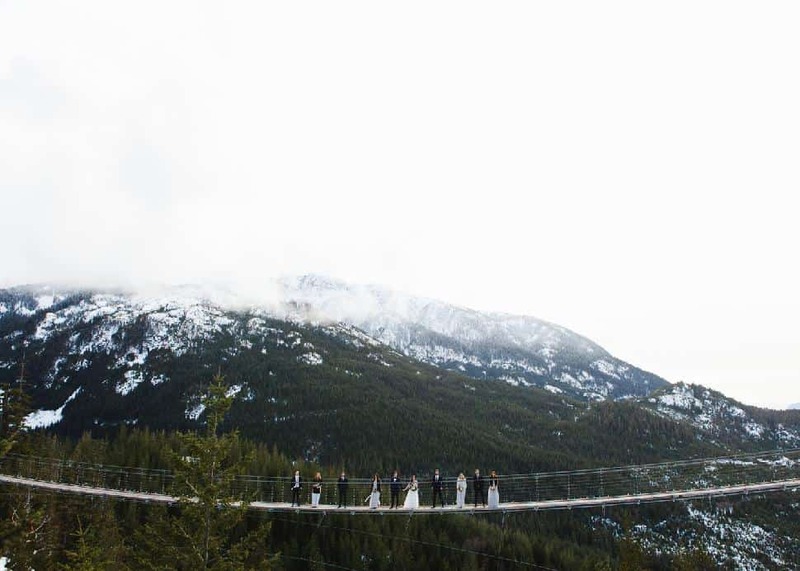 To get to and from the mountainous location, the wedding party counted on Whistler Executive Transport.